Panel requests for 2018 are now open! Click here! We're accepting submissions up through Saturday September 6, 2018 @ 11:59pm CDT. Have an idea but don't want to run it alone? Drop a comment on this thread asking for co-panelists! Or let us know and we can put the call out on social media for you. REGISTER FOR PODFICATION 2018 HERE! An informal convention for podfic creators and listeners! Join us in Minneapolis for our third year of hanging out, discussion, and recording. Exactly like a convention! 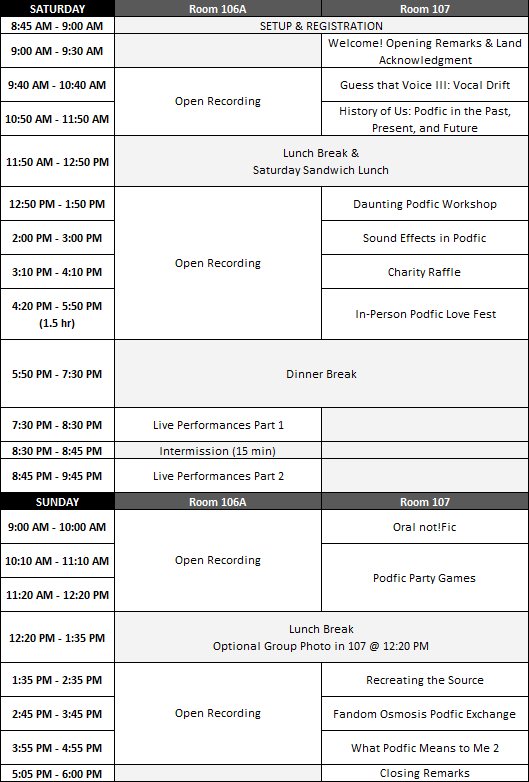 But our events take place at the Geek Partnership Society's community center rooms rather than in a conventional hotel. The Event Horizon center is a convenient bus ride from downtown Minneapolis, which has many hotels. There may also be some locals who can accommodate a few people, at their discretion. We encourage finding roommates and renting some local Airbnb's within walking distance of the venue, which has worked out wonderfully the last couple years! You can check the Lodgings Finder post to help find roommates for the weekend. Yes! And it is! We have access to three rooms, one that has some comfy couch seating for hanging out and chatting, one for recording that's as sound isolated as we can manage, and one that can be used for panels. We also have access to a small kitchenette. But let us manage your expectations a bit. There isn't much within walking distance of it. The ceilings are high, and it's right next to railroad tracks. The building is shared with other groups so sound can and will bleed between the rooms and from outside. It's not perfect, especially for recording, but it is a space we can all gather and talk about all things podfic for a reasonable cost! We want to accommodate any accessibility needs that we can! You can find our accessibility guide here. If you have any concerns or questions, please reach out to us. Are you gonna talk about the *whispers* fanfictions? You bet we are. And since those discussions can be of a mature nature, we ask that attendees are 18 years of age or older. Children under age 1 are welcome in the con space as long as they are attended by their parent/guardian since they are unlikely to be adversely affected by discussions around the nuances of the omegaverse, MPREG, and the one where they're shrimp. Awesome! You can register using a variety of payment types here for $42.00 + $2.71 Eventbrite fee (USD). I can't make it, but I think what you guys are doing is rad as heck and I want to contribute! *through tears* Bro. BRO. Get in touch with us using one of the options below and we'll figure out how to make that happen. You're a superstar. So do I, friend. So do I. We'll be periodically updating this community as time goes on with more information. In the meantime, if you want to ask us a question directly, shoot us an email (podfication at gmail), send us a tweet (@podfication), an ask at podfication.tumblr.com, or drop us a comment here. We look forward to hearing from you! We strive to be an accessible and welcoming environment to all who attend. In some cases we're limited by our venue and resources, but if you see an opportunity to make Podfication a more accessible place, please don't hesitate to let us know! If you have any questions not covered here we'd be happy to answer them as well. Send us an email (podfication at gmail), tweet (@podfication), or comment. Cost permitting, we will have snacks and food available on a first come first serve basis throughout the weekend. If you have any food allergies, we're happy to accommodate them. If you need some help locating a restaurant in the area that will meet your dietary needs, we'll have a restaurant guide in the programming book and quite a few locals on hand if you need a personalized recommendation! There's information directing to local pharmacies and grocery stores included as well. Our venue, the Geek Partnership Society Center, is located in the Waterbury Building in Minneapolis. It's a ground floor only level building with wide hallways. All rooms for our event, including the restrooms, are accessible via wheelchair. Handicapped parking is also available at the building. You can see a map of the building here. Note: There is a small 1-inch step at the doorway between room 107 and the kitchenette area. The venue should have a ramp provided, but both rooms are also accessible with no step via the outer hallway. Map showing available doors here. Expression of gender identity is embraced at Podfication and we ask everyone to respect that and the preferred pronouns of all attendees. We'll have optional pronoun stickers available for badges this year. We regret that the building's restrooms are not under our direct control and shared with other groups using the building. If you would feel more comfortable having someone accompany you to the restroom of your choice let a staffer know. For those attendees with light sensitivities, overhead lights in the rooms can be dimmed on request. We regret that our current venue doesn't allow us enough space for a dedicated quiet room. If you're feeling overwhelmed, we recommend stepping out into the hallway which tends to be quieter. There are some outdoor picnic tables available in the parking lot as well away from the building, weather permitting. You can always flag down one of our staff and we'll do our best to help as well. Panelists should keep their lips visible at all times for those who speech read. We do not have microphones available for panelists, but encourage them to please speak up to ensure everyone in the room is able to hear clearly. If using video or an animation via a presentation, please avoid any flashing/strobing lights. If you anticipate needing a large print copy of our Programming Guide, just let us know! We'll make sure one's available for you. Service animals are welcome. Please leave pets at home in deference to any attendees with allergies. Minneapolis does not allow indoor smoking, so the entire Waterbury Building is smoke-free. If you need to smoke, please do so in the building's parking lot and away from the doors. Anything you or someone else needs that we didn't cover? Please contact us! We're figuring this thing out as we go, so we're sure there are things that haven't been addressed out of oversight. Updates to this post are likely so please check in again. If you're driving, the best way is go around to the back of the building, down Van Buren St NE. There's parking up and down it. Use the glass doors marked 1121 C to enter and the rooms will be immediately on your right! If you're walking or if you're taking the bus, you'll have to walk down to Jackson St NE to enter the building since the street is elevated up to that point. Then just zig zag your way through the Waterbury halls to get to us. Or if you're coming from the North, cross the railroad tracks and head to the glass door entrance 1121 C on Van Buren St NE. Update! : Bess has made a handy video to further guide you! Hey, everyone! Podfication is just TWO WEEKS AWAY and we're busy hammering away at all the logistics, so keep an eye on Twitter and here on the comm for various updates. We're going to need to buy all the fixings for the free sandwich lunch on Saturday pretty soon. So if you're planning on partaking and have any dietary restrictions, please comment to let us know! We want to accommodate everyone if we can. So for those folks who want to organize one or more of these, you can use the comments section of this post to let people know what you're looking to record, how many voices you'll need, have people claim parts, etc. However you want to do it. If you intend to do your recording all on site, please be mindful that others will want to do the same and the recording room is for the use of all attendees. Try not to pick any 200k behemoths for the job, is all I'm saying. We'll have more details about that and how the signup process will work a little further down the road. Anyone looking for a multi-voice project to join, check the comments and let the organizer(s) know! bessyboo - The Unofficial Official Off-Site Friday & Sunday Dinners!